If you like sketchy, remote hikes with steep paths to get your adrenaline going, this one is for you. 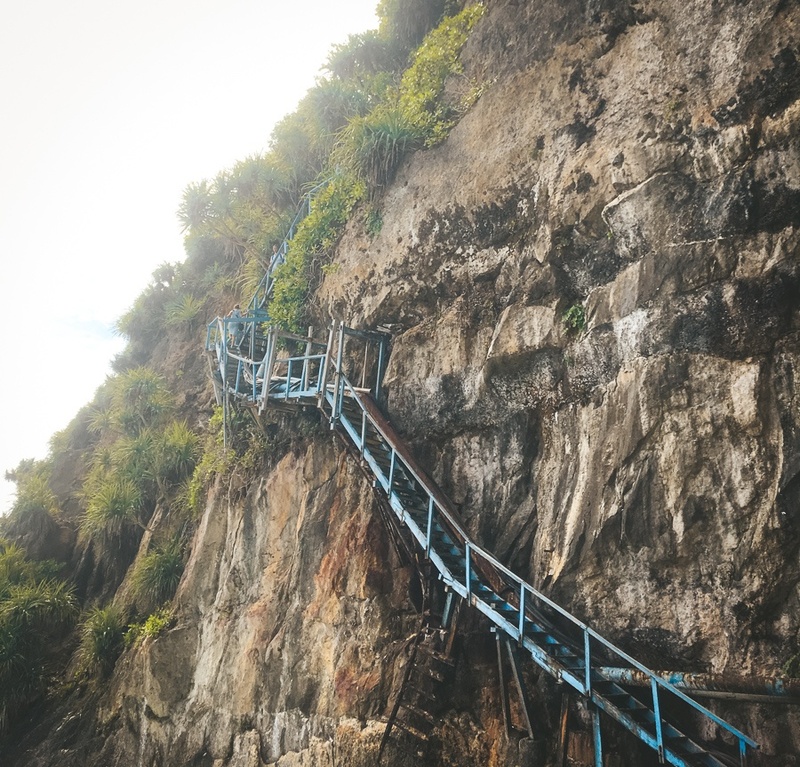 Peguyangan is a tiny waterfall (more like a trickling stream) at the bottom of some cliffs in Nusa Penida, and you reach it by climbing down hundreds of steps on a rickety old wooden stairway. Underneath the main stairway, you can even see the remains of an old stairway that broke and fell before the current one was made. The drop-offs here are lethal, and the condition of the stairs at some points is questionable (the photo below only shows the entrance, not the bad part). Proceed at your own risk! I did this hike awhile back in a soggy pair of sandals, and majorly regretted it. With that said, the conditions will hopefully improve at some point, and I have to admit I’m tempted to go back and fly the drone around to some of the amazing cliffs here. The waterfall is on the southwest side of Nusa Penida island. It’s accessible by car or scooter, about 1 hour drive from the Sampalan docks or accommodation in northern Penida. The road here is a bit rough, so take it easy. There’s a parking fee of 5,000 IDR (35 cents) as of 2019. Since Peguyangan is also a temple, you have to wear a sarong to enter, but these can be rented from the parking area for 10,000 IDR (70 cents). From the parking lot, it’s a 30 minute hike down the stairway to get to the waterfall.